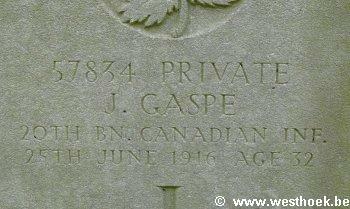 Private J GASPE 57834 20th Bn., Canadian Infantry (Central Ontario Regt.) who died on Sunday 25 June 1916. Age 32. 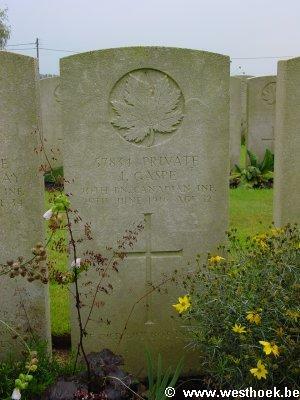 Private J GASPE 57834 20th Bn., Canadian Infantry (Central Ontario Regt.) who died on Sunday 25 June 1916. Age 32. Son of John Baptiste Gaspe (Chief of the Iroquois Tribe of Canadian Indians) and Felecile Bonspille (his wife), of Oka, County of Two Mountains. LIJSSENTHOEK MILITARY CEMETERY Grave P.Q. VIII. B. 17A.